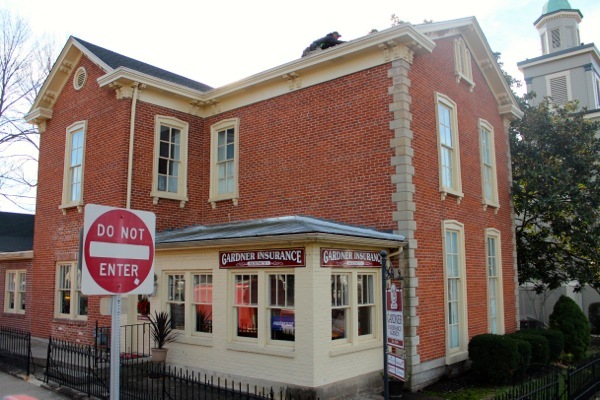 Gardner Insurance calls a Historic building home on the corner of Broadway and first street in down town Madison, Indiana. The older and stately multi level property adds history and elegance to the Gardner Insurance Company’s operation but it also adds grounds keeping and maintenance. The box gutters, in particular, had been causing the crew at Gardener a headache for some time. Each winter the box gutters would freeze and back up causing the interior wall to become saturated with moisture. This moisture was peeling paint, wetting the carpet, and even doing long term damage to the brick and its mortar. That’s when they decided to call Exterior Pro. When we arrived at the Gardener Insurance building we found an all too common scenario. The box butters had been repaired several times in the past but still continued to perform poorly. Why? The wrong type of material had been used and the lack of the correct accessories were mostly to blame. The box gutters were lined in rubber roofing material but rubber roofing rarely keeps box guttersdry especially if there is a drain leading to a down spout. Rubber roofing has no accessory to properly flash this very tricky and leak prone area. 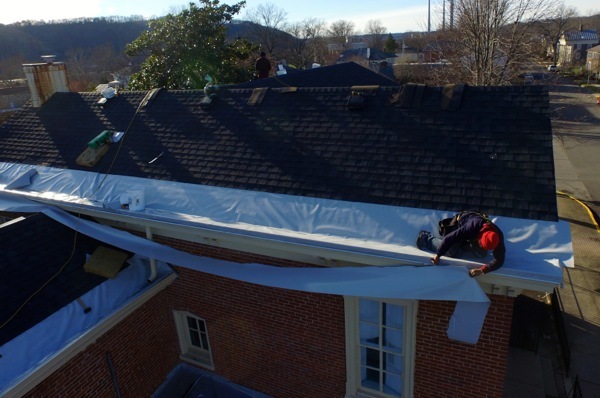 Also, rubber roofing shrinks over time meaning it pulls away from the natural fall built into the box gutter so they hold water and deteriorate the seams in the rubber sheets quickly causing damaging leaks to return. Over the recent years we have researched and developed our own version of a box gutter liner. We fabricate our box gutter liners in house from premium PVC membrane and we have a full line of accessories that accompany our box gutter lining system. We field measured the Gardner box gutters then returned to our shop located in southern Indiana to create the custom box gutter liners. 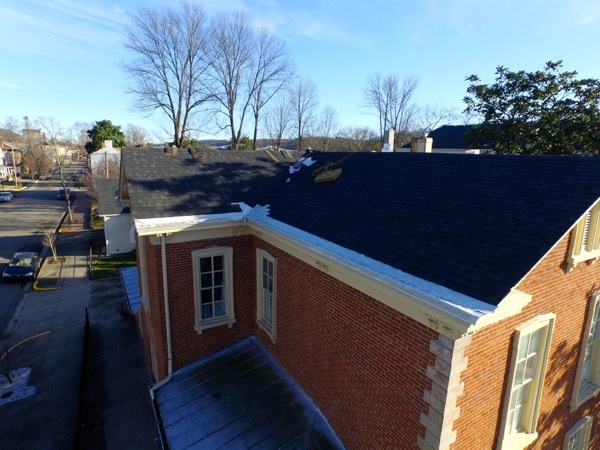 Our Box gutter liners fit perfectly into their place at Gardner Insurance building and it was now time for the accessories. 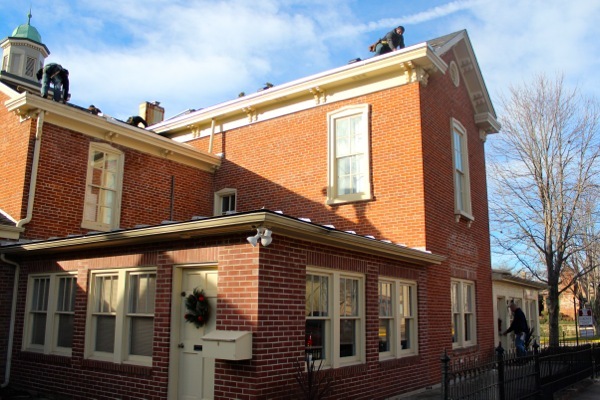 We used a two pc metal trim to not only protect the front of the decorative wood molding but to also add character to the look of the historic building. Our custom sized drain flashing run 12” down into the down spout and are sealed from the inside preventing even frozen downspouts from backing up under the new lining. Not only does the Gardner Insurance building look much nicer with new metal trims, they won’t have to worry about damaging leaks coming from the box gutters for the next 20 years. Another quality box gutter repair job from Exterior Pro Roofing. How much do box gutters cost?